Has It Really Been Two Months? Crap. I knew I’d been derelict, but didn’t realize it was that bad. Sorry! I’ll try to get back on this horse soon. It’s getting pretty late and I don’t know if I have the time to cover our sixth (and final full) day in California. We spent that day finishing up the things we hadn’t been able to get to in the previous days (and we finally got to the Griffith Observatory!). My Phobos on top of the washer. I hope to link this picture to Jenny Lawson’s post on her bout of the flu. She asked for cat pictures and I’m really proud of this one. I’m going to try to post it in a comment, but just in case it doesn’t take, I’ll post a link to this post so that she can see it. You see, Phobos has a bit of a weight problem and a few months back I began restricting his caloric intake (he used to free-feed 24 hours a day and now he only free-feeds 16 hours a day — I pick up the bowl between midnight and 8 am). So back on December 4, I was sitting where I’m sitting now and I heard a loud “WHUMP!” from the laundry room (which is behind me). 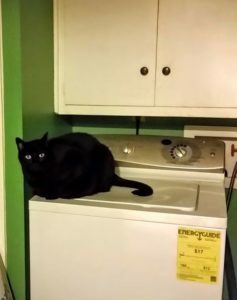 I walked back there and looked in to find that Phobos had actually managed to jump up on top of the washer. I was so pleased because this is evidence that, even if he’s not losing weight (which I’ll bet he is), his energy levels are getting better.